The new Ford Kuga Vignale Estate is the luxury, high-spec version of the Kuga that’s meant to rival the premium German cars. It’s now in its second generation, underwent a recent makeover and feels and looks better than last time. As an all-rounder, the standard Kuga is a smart car that doesn’t put too many feet wrong. However, its cabin looks dated compared to rivals, and this is something the more special Vignale trim is meant to put right. But is it worth your money over a Mercedes? Ford have been making cars for over a century. To find out more about them read our brief history of Ford. 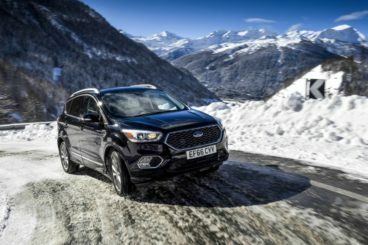 OSV takes a closer look at what it’s all about with our 2018 Ford Kuga Vignale Estate review. Back in the day, this was the best car to drive in its class. In 2018, and despite only being into its second generation, that’s no longer the case. It’s still good to drive, but there are rivals that are more composed and more agile in corners. There have been improvements since last time, with Ford adding electricity to its power steering system so that it’s now 100% electric. This saves on running costs and creates consistency with the weighting. On the other hand, it means there’s less feel. The gear shift is nice and slick, the handling is taut if not spectacular, and there’s lots of grip on offer. The Vignale models come with a smart torque vectoring system that keeps your Kuga locked into line, as well as stiffer suspension that ensures better body control than the lower spec models. The trade-off, of course, is a firmer ride. Things aren’t too bad on the motorway, but the Vignale Kuga struggles with coarser roads in the towns and cities. In terms of its engines, a 1.5-litre 118bhp EcoBoost petrol engine sits at the bottom of the range. It comes with two-wheel-drive as standard and covers the 0-62 sprint in 12.5 seconds. That’s a reasonable time if you’ll be sticking to the towns and cities for the most part, but if you’ll be venturing further out with frequency, you’ll need more oomph. That oomph comes from a 148bhp variant of the same engine. When paired up with a manual gearbox, it has a 0-62 time of 9.8 seconds. Rounding off the range is a 178bhp petrol engine. It comes with four-wheel drive as standard, but while that toughens things up and adds more grip, it also makes the car slower than the 2WD 148bhp engine. It has a 0-62 time of 10.1 seconds. Worse still, it comes with an awkward automatic gearbox that feels underwhelming, and which increases fuel costs. As such, it’s a hard engine to recommend. As the highest-spec version of the Kuga, this Vignale model is meant to go head-to-head with the likes of Mercedes. The problem is that there are only a few things that set it apart from the lower-spec models, and most of them are in the cabin. And that’s not saying a lot. Because while the Vignale does get a few interior “treats”, it needed more. It’s got extra kit and extra leather seats, but it’s still held onto some of the harder plastics as the lower-spec models. Worse still, its design is a bit cluttered and doesn’t look as neat and tidy as modern rivals. Still, there are plus points. The new car gets Ford’s latest SYNC3 infotainment system, which is a big improvement on last time. The graphics are still a bit dated but it’s more intuitive to use and responds faster. It benefits from an 8” layout too, and integrates sat-nav. Is the Ford Kuga Vignale Estate practical? We like the driving position, and the steering wheel adjusts for height and reach. The pedals are also nicely located, while the Vignale trim comes with a handy 12” volt plug socket and centre console cubby that will prove useful. However, the Vignale is built for luxury and isn’t without its problems. For example, while the seats fold flat in the lower spec models, the Vignale model comes with a larger step that makes it awkward to load your longer items. Head and legroom is good for all, though, but like a lot of these cars, four people will be more comfortable than five. Visibility is good. The boot, meanwhile, measures 456-litres and can be extended to 1,603 by folding the rear seats flat. Is the Ford Kuga Vignale Estate reliable? Read our honest assessment of Ford reliability. As the range-topping model, standard kit is good. This Vignale trim is plush inside and out and comes with its own bespoke body kit, quilted premium leather upholstery, a heated windscreen, bi-xenon headlights, 18” alloys, keyless entry and ignition, a 9-speaker Sony stereo, heating for the front seats, floor mats with double stitching, a powered tailgate, a 10-way adjustable driver’s seat, and metallic paint. Safety wise, the car scored 5/5 when it was crash tested by Euro NCAP and its standard safety kit includes an automatic parking system, a fatigue detection system, a lane-keeping aid traction and stability control, airbag, traffic sign recognition and seatbelt pre-tensioners. Prices for the new car rise to £36,095. For more information on our leasing deals, you can check out our page here. In terms of its running costs, the petrol range is more frugal than last time. The 1.5-litre petrol engine is available with power outputs of 118, 148 and 178bhp, with the latter getting four-wheel drive as standard. Buyers can specify four-wheel drive with the 118 and 148bhp variants, but doing so will bump up fuel costs. With two-wheel-drive, the 118 and 148bhp engines are good for 44.8mpg economy at best. The 178bhp variant, meanwhile, can manage 37.7mpg on a good day. It needs to feel upmarket to rival the German cars, and it does. Head and legroom is excellent, and with four adults inside, the Kuga feels very spacious. The Vignale model benefits from a wealth of advanced safety systems and we have zero concerns on this front. Buyers can pick up the standard Kuga for so much less. Then again, its economy is competitive with rivals, but diesel engines are a better bet if fuel costs are a priority of yours. Let’s see how the car fares against its rivals in the comparison section of our 2018 Ford Kuga Vignale Diesel Estate review. 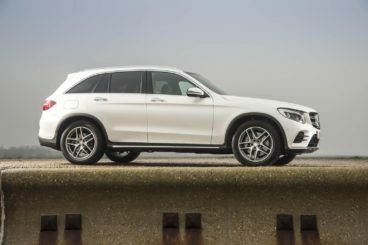 The new Mercedes GLC is an upmarket rival to the Ford that’s affordable to run, and which can turn heads with its cabin. On the road, its engines are smooth but the GLC isn’t very exciting to drive. Instead, it’s more comfortable than anything else. All models in the range get four-wheel-drive and adaptive dampers as standard, but despite its size, the GLC drives a lot like a smaller car. This figures when you consider that it shares its platform with a saloon. In terms of its engines, there’s not a lot to choose from. The Kuga’s direct challenge is a turbocharged 2.0-litre petrol unit that develops 208bhp. It has a 0-62 time of 7.3 seconds and offers a relaxing driving experience. The only alternative is a dramatic AMG GLC 43 model that’s powered by a twin-turbocharged 3.0-litre V6 petrol engine that develops 362bhp. It has a 0-62 time of 4.9 seconds and can keep going until 155mph. Running costs? That AMG model certainly doesn’t come cheap, and manages returns of 34mpg economy at best. It also emits a whopping 189g/km of CO2 and has a BiK rating of 38%. The smaller petrol engine, meanwhile, should be able to return around 48mpg on a good day – but even that might be a tad optimistic. Inside is where the Mercedes excels. It might be one of the bigger Mercedes’ on the road, but it’s just as classy and sophisticated as you’d expect a Mercedes to be. Its cabin is well built and even the cheapest model comes with lots of kit. Comfort is very good and it’s even better if you add the AIRMATIC system. Insulation is also good, although the wider tyres of the AMG model do make a bit of noise. The dashboard is shared with the C-Class saloon, so you can expect lots of style, solid controls and a gorgeous piece of gloss black veneer or wood that dominates proceedings. Is the Mercedes GLC practical? Its boot measures 550-litres, which makes it bigger than the Kuga. That’s class-leading but it’s an impressive size. Its rear seats fold 40:20:40 and it comes with lots of handy practical touches in the boot, such as two cubbies for extra storage. Other than that, head and legroom is reasonable in the car’s rear and interior storage is fine. The new Audi Q5 is a powerful and efficient family car that’s comfortable, roomy and practical. On the road, it’s a genuinely great car to drive, and the main reason for this is that – despite being so tall – it drives more like a hatchback. It’s much smoother than last time too, but if you’re looking for a car that excites you, this isn’t the one. In terms of its engines, Audi have fitted the standard model with just the one petrol. This is a 2.0-litre engine that develops 249bhp, and which can be found in a number of other Audi’s. It’s smooth, fast, and completes the 0-62 sprint in a matter of 6.3 seconds. Should you want more power, the SQ5 features a lower ride height, sportier handling, and a massive 3.0-litre V6 engine that develops a titanic 349bhp. It can propel you from rest to 62mph in 5.4 seconds. Running costs? The smaller petrol engine is capable of 46.5mpg economy on a good day if you stick to the 18” alloys. It emits 156g/km of CO2 and has a 30% BiK rating. 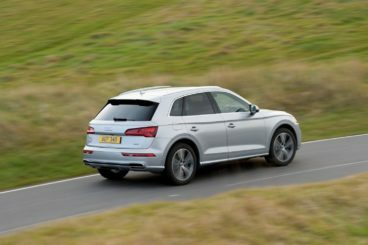 The SQ5 model, on the other hand, will be lucky to return 35mpg, while all Q5’s sit between insurance groups 29 to 50 – which is the highest there is. Inside, the Q5 shows us how much of a premium product it is. It’s clearly designed, luxuriously appointed, and build quality is excellent. The only real criticism we have is that the seven-inch infotainment screen “floats” on the dashboard. It also looks like it’s been placed there haphazardly. Other than that, there’s nothing to argue about. Insulation is better than ever, and everything is easy to use. Is the Audi Q5 practical? As well as being very user-friendly it’s also ergonomically sound, storage solutions include a big glovebox, and leg and headroom is good for all. Four rather than five adults will be more comfortable, however, thanks to a four-wheel-drive system that compromises the middle seat. The boot, meanwhile, measures as much as 610-litres with all the seats up. To get that amount of space, you need to slide the rear seats forward. Keep them further back and it measures 550-litres. A Ford or a Mercedes? It seems almost like a silly question but this Kuga Vignale is a genuinely upmarket contender. It’s safe, roomy, practical, excellent to drive and boasts a high-quality cabin that comes with the likes of heating for the front seats and classy leather upholstery. Should you choose the Kuga Vignale over an Audi or a Mercedes? For out and out luxury, the Germans win. 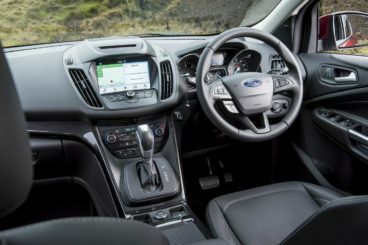 If you like the Ford brand and want more quality and comfort from your family car, the Ford Kuga Vignale Estate is at least worth a test drive.